Ulysses S. Grant's birth name was Hiram Ulysses Grant. Ulysses S. Grant and his family moved to Georgetown, Ohio in 1823. Ulysses S. Grant attended public school in Georgetown, as well as the school of Richeson and Rand at Maysville, Kentucky (1836-1838), and the Presbyterian Academy at Ripley, Ohio (1838-1839). New York Congressman Thomas L. Harvey's nominated "Ulysses S. Grant of Ohio" for an appointment to the United States Military Academy, but mistakenly did not use his birth name. Once at West Point, Grant adopted the name on the application, with the middle initial only. Ulysses S. Grant entered the United States Military Academy in 1839. Ulysses S. Grant was the best horseman in his class at the United States Military Academy. Ulysses S. Grant graduated from the United State Military Academy in 1843, ranked twenty-first in his class of thirty-nine. Ulysses S. Grant was commissioned as a second lieutenant in the United State Army on July 1, 1843. Ulysses S. Grant fought in the Mexican-American War. Ulysses S. Grant married Julia Dent on August 22, 1848. Ulysses S. Grant resigned his commission in the United States Army on April 11, 1854. His resignation was accepted by Secretary of War Jefferson Davis on June 2. On March 29, 1859, Ulysses S. Grant freed William Jones, a slave he had inherited from his wife's family. Ulysses S. Grant was commissioned as a colonel in the 21st Illinois Infantry on June 17, 1861. President Lincoln appointed Ulysses S. Grant as a brigadier general of volunteers on July 31, 1861 (retroactive to May 17, 1861). Ulysses S. Grant commanded his first Civil War engagement at the Battle of Belmont on November 7, 1861. Ulysses S. Grant captured Fort Henry, in western Tennessee, on February 6, 1862. Ulysses S. Grant captured Fort Donelson, in western Tennessee, on February 16, 1862. After capturing Fort Donelson, Ulysses S. Grant acquired the nickname of "Unconditional Surrender" Grant, due to the terms of surrender that he dictated. Ulysses S. Grant was promoted to major general of volunteers on February 16, 1862. Ulysses S. Grant rallied his soldiers to victory at the Battle of Shiloh on April 7, 1862, after being surprised and driven back by a Rebel attack on April 6. Ulysses S. Grant was vilified in the press and accused of being drunk when Confederates launched a surprise attack at the Battle of Shiloh (April 6-7, 1862). Ulysses S. Grant lost his field command of the Army of the Tennessee when Major General Henry Halleck personally took command of operations in western Tennessee after the Battle of Shiloh (April 6-7, 1862). Ulysses S. Grant was restored to command of the Army of the Tennessee on July 11, 1862, when Major General Henry Halleck was promoted to General-in-Chief of the Union Armies. 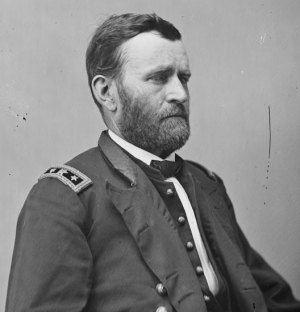 Ulysses S. Grant issued his ill-conceived General Order Number 11, on December 17, 1862, expelling all Jews from the Department of the Tennessee. The order created such a protest throughout the North that President Lincoln rescinded it on January 4, 1863. Ulysses S. Grant accepted the surrender of Vicksburg, Mississippi on July 4, 1863, following a six-week siege. Ulysses S. Grant was promoted to major general in the regular army on July 3, 1863. Ulysses S. Grant was promoted to commander of the Military Division of the Mississippi on October 16, 1863. Ulysses S. Grant lifted Confederate General Braxton Bragg's Siege of Chattanooga by establishing the "Cracker Line" and winning the Battle for Chattanooga (November 23-25, 1863). Ulysses S. Grant was promoted to lieutenant general and General-in-Chief of the United States Armies on March 17, 1864. Ulysses S. Grant traveled with Major General George Meade's Army of the Potomac and personally oversaw the pursuit of General Robert E. Lee's Army of Northern Virginia toward the end of the Civil War. Robert E. Lee surrendered his Army of Northern Virginia to Ulysses S. Grant at Appomattox Court House, Virginia on April 9, 1865. Ulysses S. Grant was promoted to General of the Army of the United States on July 25, 1866. Ulysses S. Grant served two terms as President of the United States, from March 4, 1869 to March 4, 1877. Ulysses S. Grant was swindled out of his life savings and left in debt following the collapse of the firm of Grant and Ward on May 6, 1884. Ulysses S. Grant was diagnosed with throat cancer in November 1884. On February 27, 1885, Grant signed a contract with his friend Mark Twain to publish his memoirs and thereby provide for the support of his family after his death. On March 4, 1885, President Chester A. Arthur signed legislation restoring Grant to the rank of General of the Army, providing Grant's family with a much-needed pension. The first volume of the Personal Memoirs of Ulysses S. Grant went to press on May 23, 1885. By that time Grant was no longer able to speak. Wracked with pain, Grant used pencils to scribble the second volume of his memoirs on paper tablets. Grant completed the second volume on July 19, 1885. Ulysses S. Grant died on July 23, 1885, at the age of 63, at Mount McGregor, New York. Ulysses S. Grant was buried in Riverside Park, New York on August 8, 1885. Ground was broken for Ulysses S. Grant's Tomb on April 27, 1891. Grant's Tomb was dedicated on April 27, 1897. Ulysses S. Grant's portrait appears on the front of United States $50 bills.